It’s no secret that Facebook is constantly changing up the rules on users – whether we’re using Facebook for personal or business purposes. Sometimes it just makes you want to scream, right!? Users – any user, including non-fans – can post on fan page walls and like-comment-share fan page content. So basically, a Facebook user doesn’t have to “like” your fan page before they can interact with your content. This is a good thing! For business/fan pages, the emphasis has shifted slightly from gaining more “likes” (fans) to increasing the number of “shares” on each piece of content you post. A new Facebook for Business goal is to craft fan page posts in such a way that fans, their friends, and visitors to your page want to SHARE with their network of friends. This essentially sets in motion a ripple of viral visibility. Basically, FREE additional exposure. Photos on Facebook have always gotten better visibility in the News Feed. But, don’t necessarily use an image on every single post; keep it interesting by mixing in links, videos, questions, and text only posts. When you do share photos, make sure they look great and are eye-catching in a smaller version, given most people will see a reduced size in their News Feed and/or mobile app. Experts claim that posts 80 characters or less in length receive 27% higher engagement rates. Considering how much content flies by users eyes, it makes sense that a shorter post will catch their attention quicker, and more often. Writing in first person certainly creates more warmth and connection with your audience. But in order to increase your shares on Facebook, you might want to experiment with keeping the wording more generic. Write in a way that could sound like it was coming from others. “How adorable is this! ?” “Don’t you love this fabulous pair of stilettos? !” You can always use first person in your comments when responding to bring in the more personal touch. 4. Share a great cause. You’ve all seen them…a precious dog photo with a call to action – like this one. Pet supplies company Iams had agreed to donate 50 bowls of pet food for shelter animals for every comment on the photo, up to one million bowls. The photo broke the record in just over 24 hours. 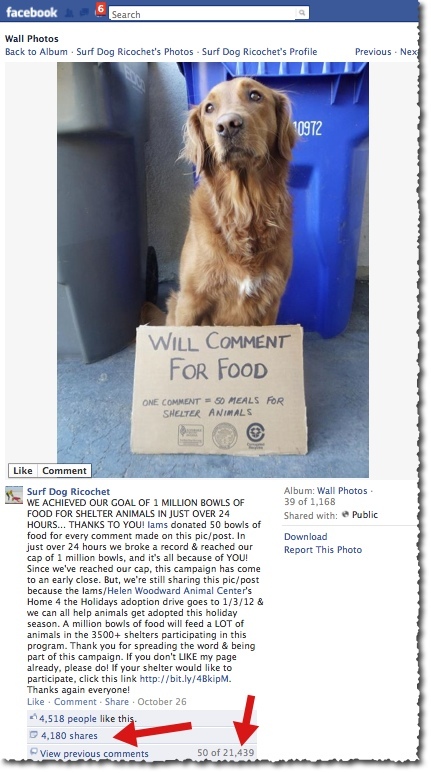 Though the one million bowls of pet food goal has been attained, the image is still gaining comments and shares. I mean, really…how can you resist!? One last, yet very important, tip on “shares” – Whenever possible, take time to click through and thank those who share your content. This is really easy to do as the “shares” show in a popup window and you can easily click like and add a quick comment. People love to be acknowledged. I can SO relate to your photo! Thanks!